These are just a few of my favorite things, and when I’m watching horror I’ve always got my eyes peeled for the grisly money shot. 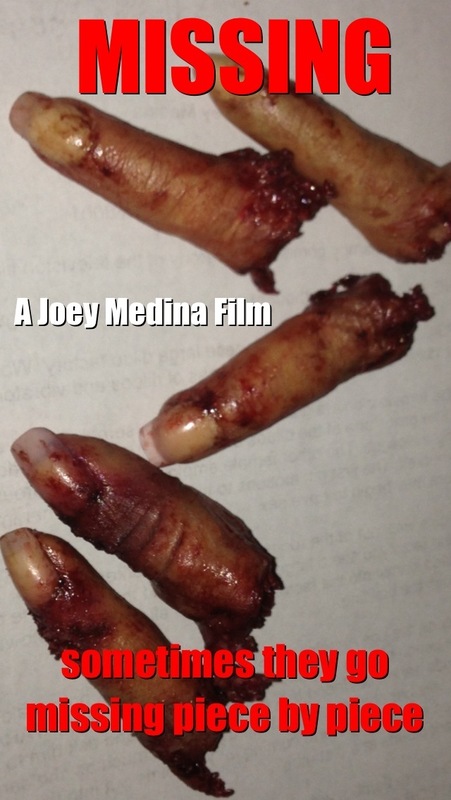 And when it comes to the good stuff, the really nasty and ultra-violent carnage that we all love and adore, Joey Medina’s short horror film “Missing” does not hold back. In fact, “Missing” didn’t just satisfy my thirst for blood, but pretty much dumped a bucket of it onto my face. It’s a brutal, unflinching horror experience that managed to shock me all the way until the very end. I absolutely loved this film! “Missing” is the type of film for the most depraved horror lover, and those are usually the ones that hit me just right. Essentially, we follow a day in the life of a LA’s most twisted serial killer…dig it? But what “Missing” succeeds in most is not only the carnage, but also a very stylized and unique viewing experience, as Medina takes a popular concept and gives it his own stylized twist. Without going into too much detail, I will say this: Medina made blood the main character, and oh what a role it plays. There are also some excellent performances by a cast of oddly charming actors who all bring their A-games to a really intense story. To learn more about Joey Medina, visit his official webpage. You can also “like” the film on Facebook and follow Medina an twitter. This entry was posted in LA Horror Review and tagged bloody, coming soon, fear, gore, horror, murder, real murder, review, torture. Bookmark the permalink.